You are currently browsing the The Pet Product Guru blog archives for the day Saturday, January 26th, 2019. What Does It Mean When Your Cats Tail Gets Puffed Up? Cats can show their emotions just like humans and when your cats tail gets puffed up there could be a variety of reasons for this. Yesterday I was brushing my cat Millie as I always do and suddenly her tail began to “puff up.” It didn’t completely puffed up but it was starting to. What caused this, there was no aggression or reason for her to get scared? 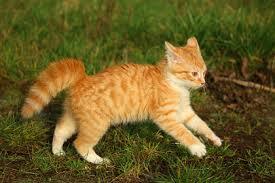 A cats tail will get puffed up when they are startled or scared. Aggression and anger also will cause your kitty’s tail to puff up. Again, he may hold his tail straight up or straight down. He may also lay his ears back. Another sign is very constricted pupils. Aggressive or angry cats puff up not only their tails, but the fur all over their bodies. A puffed-up tail can also be a sign of submission. When a submissive cat is trying to avoid a confrontation with a dominant one, his tail puffs up and is lowered or even tucked between his legs. These positions communicate submission to his opponent. So as you can see there are different reason for you kitty to puff it’s tail up. Don’t worry, it’s a normal emotion and will occur from time to time. Thanks to The Nest.com for providing some of this information. Keep the oldies playing all weekend long! EDGEWATER GOLD RADIO, the place for the best variety of oldies. Listen on your Amazon device. Tell Alexa to “play Edgewater Gold Radio! add comment Comments Off on What Does It Mean When Your Cats Tail Gets Puffed Up?